A New Map of Egypt, from the Latest Authorities. 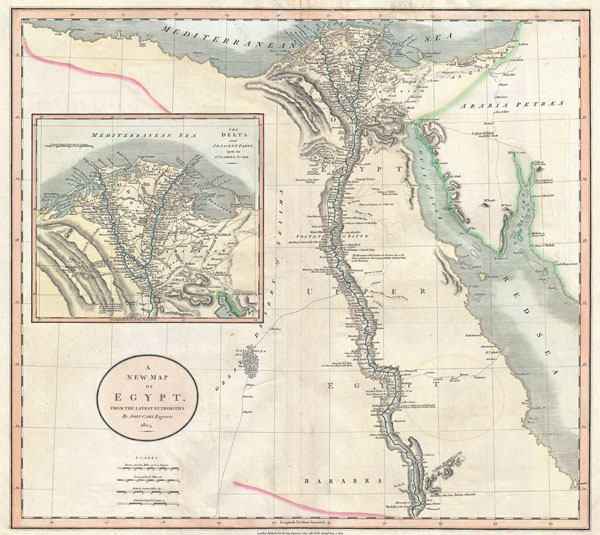 An exceptionally beautiful example of John Cary's important 1805 Map of the Egypt. Covers Egypt in extraordinary detail focusing on the course of the Nile River Valley from the Delta region south to Aswan. Notes the sites of numerous riverside villages and cities as well as important ancient Egyptian ruins, Coptic and Abyssinian Monasteries, and important caravan routes between important desert oases. Also notes the locations of both Mt. Horeb and Mount Sinai, in the Sinai Peninsula. The left hand side of the map is dominated by a large inset of the Nile Delta region. This wonderful inset offers details on ancient ruins and European explorations in the region as well as noting numerous delta cities, villages, and trade routes. All in all, one of the most interesting and attractive atlas maps of Egypt to appear in first years of the 19th century. Prepared in 1805 by John Cary for issue in his magnificent 1808 New Universal Atlas. Very good condition. Minor verso repair and reinforcement on original centerfold. Blank on verso. Minor offsetting. Rumsey 1657.051. Phillips (Atlases) 714. The Map Collector, issue 43, p. 40-47 (Atlas). National Maritime Museum, v. 3, no. 311 (Atlas). Phillips (Atlases) 714. The Map Collector, issue 43, p. 40-47 (Atlas). National Maritime Museum, v. 3, no. 311.